The Saints went to Wellington to play footy , and wore Maori themed Football Jumpers . 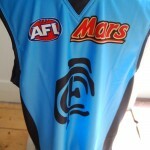 Last weekend , the Blues played in heritage styled AFL Football jumpers , jerseys , guernseys . On Sunday , pre the Bulldogs , Demons , clash a field of supporters wearing pink ponchos , will form the pink lady on the MCG , to raise awareness of breast cancer . Whilst the Saints and Blues both lost their matches , while wearing a non - traditional football guernsey , the pink initiative is a positive initiative . 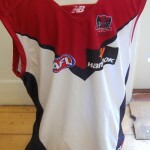 In previous years, Melbourne FC , had played in pink themed football jumpers . On Sunday they will be happy to have Jack Viney , back in their team , after his contentious suspension , for rough play , was withdrawn . This entry was posted on Friday, May 9th, 2014 at 8:04 am	and is filed under AFL, football jumpers, NRL. You can follow any responses to this entry through the RSS 2.0 feed. Both comments and pings are currently closed.